Established in 1823 and incorporated two years later, this city is named after the combination of Mary and Anna Beveridge, daughters of the original owners of the site. Located 65 miles west of Tallahassee, Marianna is the home of Merrits Millpond, with over 200 acres of fine fishing and scuba cave-diving, a crystal clear pond which is fed from the Blue Springs underground source. Very cool in water temperature (around 68 degrees), the Blue Springs recreational area is open Memorial through Labor Day. 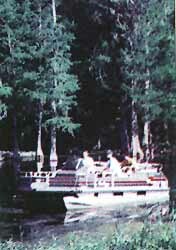 Also superb for fishing is the Chipola River, a fisherman's paradise as well as a wildlife treasure trove. The Indians who lived along the river long ago left many artifacts behind, and more can be discovered by lucky visitors today. Florida Caverns State Park is in Marianna, with trails and passages leading to the spectacular caves, offer conducted tours hourly, from 9-5 each day. Nature trails and picnic areas are offered, while cool bathing can be found at the Blue Hole swimming area. There is one 18-hole and two nine hole golf courses in or near Marianna. Bear Paw Canoe Trails on Magnolia Road offers canoe trips of different durations. Tubing trails are also on hand for a more leisurely pace. For warmer water bathing, try Turners Landing, at the east end of Marianna. Its shallow waters are more suitable for young children. The Downtown area features many interesting shops and cafes, and is currently undergoing a revitalization effort to restore a thriving business community.